Schluß. This is the end. The time has come for me to end my seven-part series on the wonders of Köln, or, as they say in westernised Germany, “the time has come for me to end my seven-part series on the wonders of Köln”. Anyone who has been to Köln before or who is familiar with the city from any vague glance at a travel book should know that there is one major part of the Kölnisch landscape that I have neglected to mention. That major part is, of course, the majestic museum to the memory of the inventor of Eau de Cologne, which basks triumphant on the corner of the cathedral square. So I think it is only fitting that I end my series of accounts by not writing about that at all, and writing about the second most major part of the Kölnisch landscape instead – the Hohenzollernbrücke. I was fortunate enough to get a chance to cross this monument on the final day of my travel diary in a frantic search for an U-Bahn station that wasn’t undergoing repairs, and dank Gott for it – it is sublime. 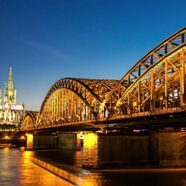 In the simplest of terms, this is a large bridge composed of several steel arches that straddles the Rhine just as it passes the Köln cathedral, and it features both train tracks and walkways for pedestrians. As a piece of engineering alone it is not particularly attractive, especially when compared to the sleek genius of the bridges in places like Düsseldorf, and it is surrounded by four statues of famous German leaders on horseback which include, to my moderate bafflement, Kaiser Wilhelm II. Even though the view is pleasant and it is readily accessible, there is nothing physically outstanding about it; but the real magic lies in everything it represents. Since 2008, as far as I’m aware, thousands of people, from Germany and abroad, have taken to placing lovelocks on the bridge. The fences between the train tracks and the footpaths are warmly clad in countless little padlocks that stretch from end to end as far as the eye can see, and when you look to the bridge from the south, at some point along the riverside path that bounds the Old Quarter, they glint and gleam in the sparkling sunlight like a whole universe of newborn stars. Overtime, trends have emerged – padlocks of different metallic colours are now in fashion, to add a rainbow flair to the scene; padlocks of different creative shapes, from hearts to treasure chests, are proving popular; couples tend to engrave their names or at least their initials on the face of their locks; artists have begun spraypainting masses of locks to create almost a mural. And best of all, every single lock tells a story. It is a deeply personal story, forever unknown to any passing tourist, but forever special and secure in the heart or hearts of whatever person or people went to the effort of buying that lock and leaving it there for the rest of time. The Hohenzollernbrücke is not just a bridge, but a symbol of hope, of caring, and of lasting things. It is a symbol for everyone who has ever fallen in love with a person or indeed with a city. It is a symbol of common international affinity for Köln, putting the city firmly on the map and lending it the global significance that it truly deserves. It is an overwhelming joy for me to discover that a city that has come to appeal so much and mean so much to me over the last seven days also means that much to innumerable nameless wayfarers the world over. So I would very much hope that, after all I have written this past week, if anyone still needs some convincing that this little German city is worth a visit, the Hohenzollernbrücke is the proof they require that Köln is a wonderful, wonderful place, in a world that is losing more of its wonder every day. I could go on. There is more that I have seen in seven days than the most Tolkien-esque of memoirs could not hold. I forgot to say that everyone smokes, that everyone has a dog of some description that follows them everywhere, and that everyone can probably board an U-Bahn without getting their tickets checked once (but don’t try it). I haven’t mentioned the Sprachkurs facilities, I have neglected to address the ecstasy that is the consumption of a Bratwurst (rest assured, it is a most phenomenal experience), and I have not even skimmed the surface of trying to understand the unique psychology of the German people (such a task may not in fact be possible at all). But, you know what, I think I’ve done enough. All I can really say is that I have tried to remain as honest as possible throughout, but above all have attempted to give a sense of just what it was that made me love the place so, and if Köln is still not exactly your cup of tea (or cup of coffee, as the Germans prefer), then I am genuinely sorry. I have said all that I can say, and at the least I hope you’ve had fun reading this, and at the most I hope I’ve conveyed some inkling of just how important this city is to me, to the world, and perhaps one day to you.